The SDSU Adaptive Fitness Clinic is a community outreach program through the School of Exercise and Nutritional Sciences at San Diego State University that serves individuals from the San Diego region with minor to severe physical and neuromuscular disabilities as well as those interested in Active Aging and offers them the opportunity to reach their fitness and exercise goals. Clients’ ages have ranged from 2 to 98 years. The SDSU Adaptive Fitness Clinic also serves as an immersive, educational experience for SDSU Kinesiology students, including those majoring in prephysical therapy and fitness specialist emphasis. Students, under the direct guidance and supervision of faculty and staff, work directly with the clients on a variety of exercises and activities. The Clinic was founded by Dr. Peter M. Aufsesser in 1983 with the help of a federal grant from the Office of Special Education and Rehabilitation Services. 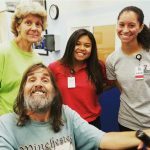 The program was developed with the goal of providing a dual service-training model – offering fitness assistance to individuals with minor to severe physical and neuromuscular disabilities, and training students majoring in pre-physical therapy and fitness specialist emphasis. 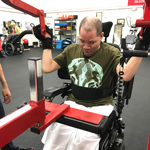 Since 1983, the SDSU Adaptive Fitness Clinic has provided thousands of students with a state-of-the-art, hands on training experience in which to hone their skills, and has offered over 1300 individuals with various disabilities a place to improve their strength, endurance, flexibility and overall health and wellness. The Clinic currently serves over 160 clients each semester and trains over 400 students students per year.